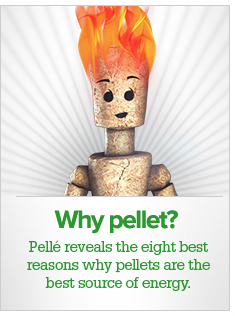 From the search for an environmentally responsible alternative arose the leading light in pellet boiler systems. The secret: never settle for what has been achieved so far and continue to work on constant improvements. In 1997 ÖkoFEN produced the first pellet heating system. The beginning of a sucess story. The Pellematic pellet boiler system uses technology that has been tried and tested over years, impressing with both total reliability and highest quality workmanship. ÖkoFEN only makes wood pellet boilers. This means we have a specialist knowledge that supports constant innovation, such as the first pellet boiler tested to independent standards, condensing technology for pellets and a combined solar/pellet system for new buildings. Pellematic heating systems are both flexible and adaptable. If you add an extension that requires extra heating, or your insulation is enhanced, a Pellematic boiler can adapt to this with only minor adjustments, ensuring the perfect amount of heat is always available. systems. The unique ash box is a great example of this. All of the ash produced collects in an easily removable ash box, from which it can be disposed of in a completely dust-free manner. Austria is renowned for the innovation and high quality of its engineering sector. Thoughtfully designed and skilfully manufactured products are the result of a national commitment to high standards of education and training and a passion for research and development. This gives technology from Austria a desirability all of its own and ÖkoFEN products are no exception. Pellet boiler systems from ÖkoFEN are always at the cutting edge of technology. Our engineers are focused on continuous technological advancement which has led to breakthroughs in optimised combustion, efficient condensing technology and user-friendly systems like the Pelletronic Touch heating controller. We are always searching for new solutions. The development of the world‘s first type-tested pellet boiler, the integration of condensing technology with pellets, and the presentation of a pellet boiler for generating power have made us the benchmark in heating with pellets. Furthermore, we are committed to environmental protection. Apart from using the C02-neutral, renewable raw material that is wood, we feel committed to the environment in other areas as well. 100% reen electricity, low-energy construction methods for our company buildings, electric vehicles for company cars – to name just a few examples. Listen, consider, act sustainably – this is our creed in our dealings with each other, our partners, our customers and the public. The result: Continuous product improvement and long-term decentralised structures lead to top marks in customer satisfaction surveys within our markets. An extremely reliable and robust product of the highest technical standard. This is our aspiration along the entire chain. From research and development, to production, through to customer service, the trust of our customers and the requirements of the future are our obligation and our motivation.